Search for all "RGPD5 / RGPD6"
Rabbit anti Human RGPD5 / RGPD6. 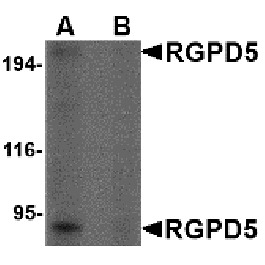 RGPD5 antibody was raised against a 23 amino acid peptide from near the center of human RGPD5. Western blot: 1 – 2 μg/ml. 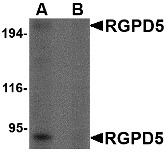 The RANBP2-like and GRIP domain containing 5 protein (RGPD5) has high similarity to RANBP2, a large RAN-binding protein localized at the cytoplasmic side of the nuclear pore complex. The gene coding for RGPD5 is thought to have arisen from a gene duplication event of RANBP2 as these highly homologous genes are located close to each other at chromosome 2q11-q12. RGPD5 was identified as an HIV dependency factor (HDF), suggesting that RGPD5 may be an important drug target in HIV treatment. At least two isoforms of RGPD5 are known to exist, of which the shorter isoform is expressed primarily in testis, while the longer of the two is expressed at low levels in a number of somatic tissues. Nothwang HG, Rensing C, Kübler M, Denich D, Brandl B, Stubanus M, et al. Identification of a novel Ran binding protein 2 related gene (RANBP2L1) and detection of a gene cluster on human chromosome 2q11-q12. Genomics. 1998 Feb 1;47(3):383-92. PubMed PMID: 9480752. Brass AL, Dykxhoorn DM, Benita Y, Yan N, Engelman A, Xavier RJ, et al. Identification of host proteins required for HIV infection through a functional genomic screen. Science. 2008 Feb 15;319(5865):921-6. doi: 10.1126/science.1152725. Epub 2008 Jan 10. PubMed PMID: 18187620. Wang LF, Zhu HD, Miao SY, Cao DF, Wu YW, Zong SD, et al. Molecular cloning and characterization of a novel testis-specific nucleoporin-related gene. Arch Androl. 1999 Mar-Apr;42(2):71-84. PubMed PMID: 10101573.